And so, not for the first time, we must ask ourselves – what are we going to do when they come for us? I don’t know about you, but I’m probably going to sit down with a big bag of popcorn, a fizzy drink of some sort, and watch whatever explosive antics Mike Lowrey and Marcus Burnett get up to for the third time around in Bad Boys 3, or is that Bad Boys For Lif3, or Bad Boys (For Life) 3? Whatever it’s called, it’s happening, they’re coming for us, and I’m excited. 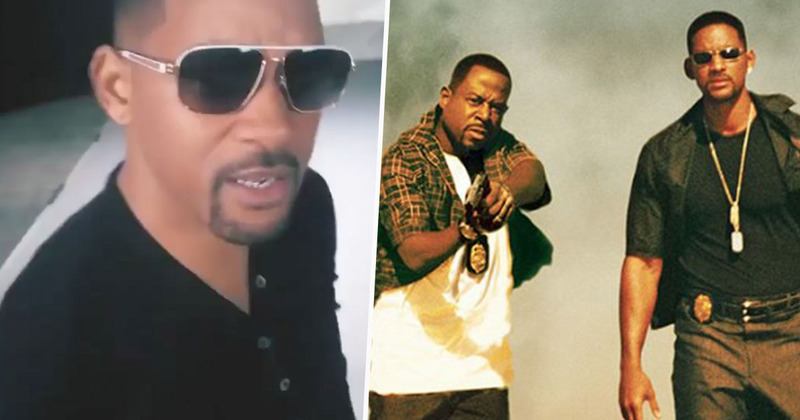 The third instalment has only just started filming, in fact it’s only been a matter of hours since cameras began rolling, apparently, but we’ve already got our first glimpse of Will Smith as Mike Lowrey, thanks to our old friend – social media. The short snippet was posted to a Will and Jaden Smith Instagram account. And though it’s not exactly our main man running through an aircraft hangar blowing stuff up, it is our main man looking pretty darn cool as Detective Lowrey, dressed all in black, complete with some fresh shades, a snazzy watch and some – I’m guessing – expensive accessories. The cast are only a few hours into filming. In fact – at the time of writing – it was only 19 hours ago Will Smith said it was ‘first day of shooting tomorrow’. He also said he and co-star Martin Lawrence watched both Bad Boys films over the weekend in order to fully prepare themselves. None of this slimming down or bulking up going on, or going all Christian Bale on us, these guys know how to prep. Being day one of filming, we’ll have some time to wait for the finished article. Fortunately, rather than being strung along for an indefinite amount of time, we already know the release date. The film is set to be released on January 17, 2020, almost exactly a year from now. It seems like a pretty tight turnaround for such a highly-anticipated blockbuster, so I hope Smith and Lawrence have learnt their lines.